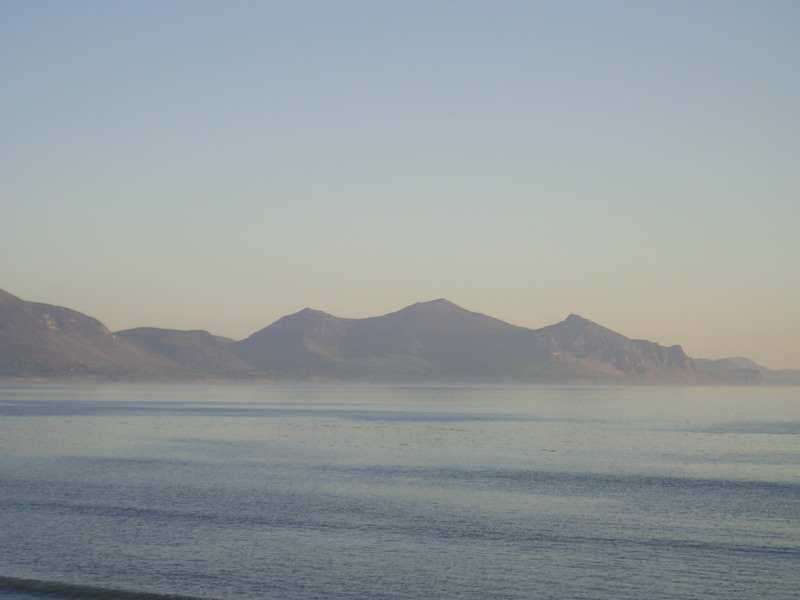 I’m an unashamed fan of the Llŷn Peninsula. This is, without doubt, one of the most delightful parts of Wales, and on a good day the mix of mountain and sea can’t fail to please. So two visits in the space of a week was a real treat, even if both trips involved an early start and a severe dose of the M60 morning rush (if sitting in standing traffic can be regarded as a ‘rush’). Still, it’s a price worth paying for Yr Eifl at the end of the drive. 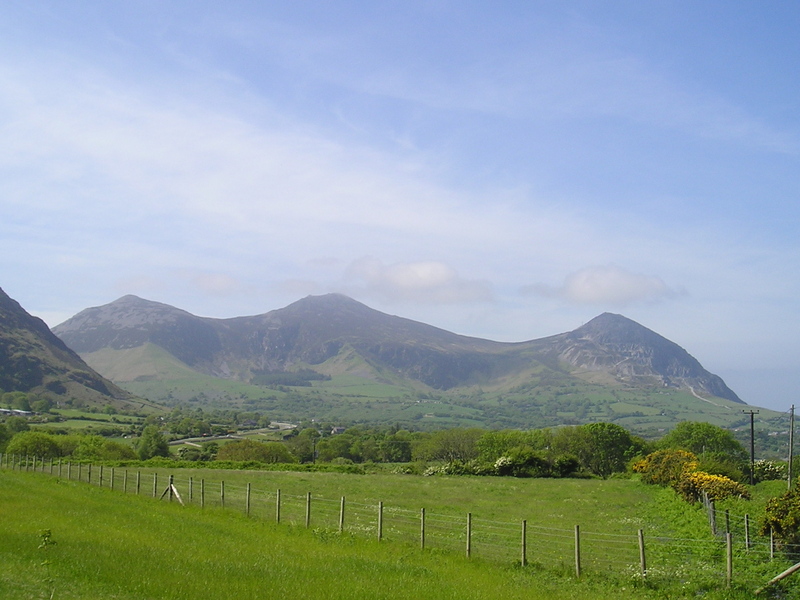 Yr Eifl means ’The Fork’, for reasons that become obvious on the approach from Caernarfon – the three peaks are presented like the prongs of a fork, with Garn Fôr (‘Sea Cairn’) to the right, looking as though it might slide into the sea below. 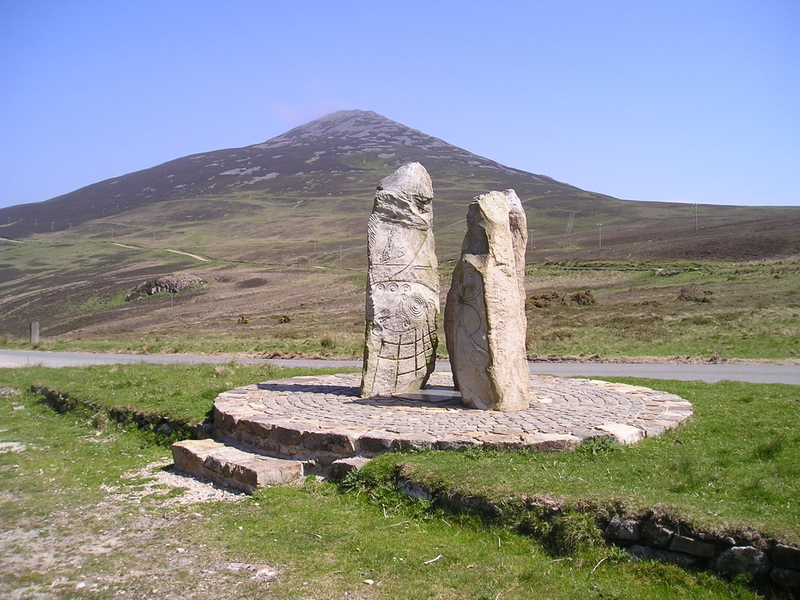 The centre prong is Garn Ganol (‘Centre Cairn’), the highest hill in Llŷn at 564 metres. 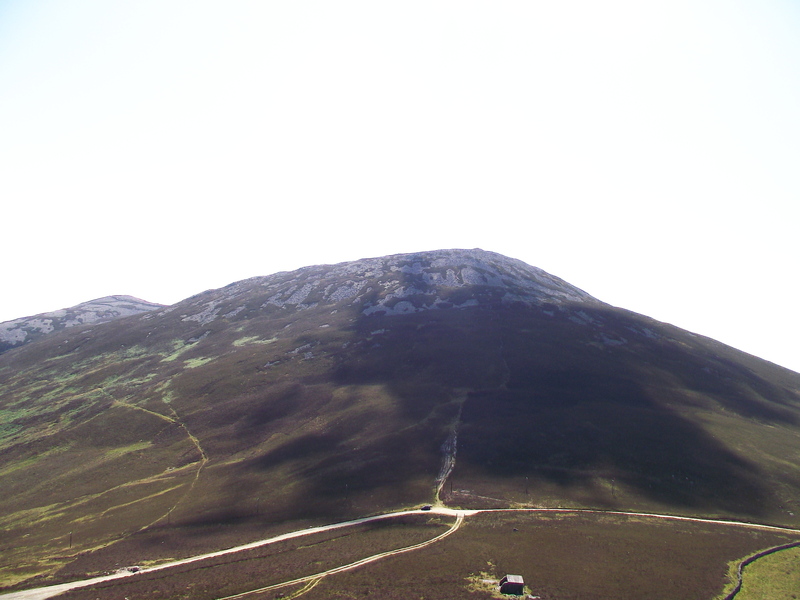 The third peak of Tre’r Ceiri (‘Town of the Giants’) is perhaps the most intriguing of the three, with an Iron Age hill fort ringing the summit. The two trips were booked by Natural Retreats, a company providing luxury self-catering holidays in some of the most stunningly beautiful parts of the UK. Last weeks walk had been with Neil and Kay, in what was less than perfect weather – despite a chill breeze and hill mist we had managed to get round the three peaks in a reasonable time. This week the trip was part of a press promotion by Natural Retreats. The team for the day was broadcaster and journalist Penny Smith, with Vince Leigh doing the honours as photographer. My job was to pick the most interesting way over Yr Eifl’s three summits, and ‘Mist’ was working hard at just being a Border Collie! 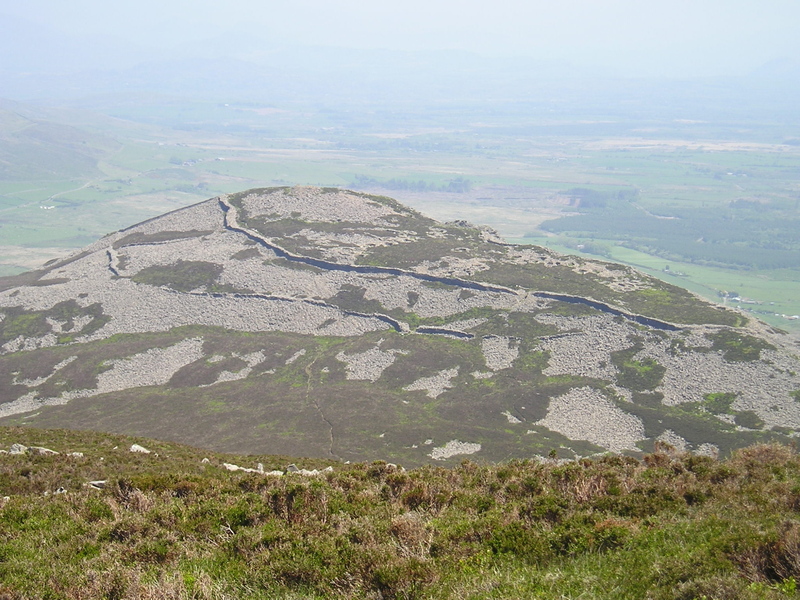 My favourite route round the three is to start off from the car park at the top of Nant Gwrtheryn and to follow the bridleway up to the ‘bwlch’ (pass) on the old pilgrims route to ‘Ynys Enlli’ (Bardsey Island) – Garn Fôr is just above the bwlch. 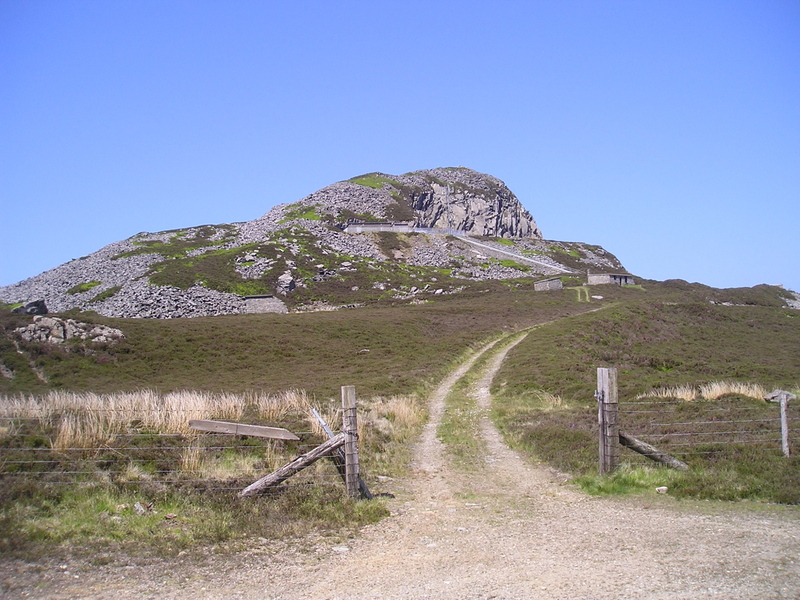 At 444 metres height, Garn Fôr isn’t exactly the biggest of hills, but its slopes are steep and strewn with boulders. There is an easy option, though. A set of concrete steps lead up to the repeater station mast to the south, and from there a well constructed set of stone steps allow easy progress to the summit. Well, they did today – last week Neil, Kay and I had slipped and slithered our way up and down these steps in damp weather conditions. Next on the list was the ‘Centre Cairn’. We had to retrace our steps down to the bwlch, and from there is was a steady pull up to the summit of Garn Ganol, highest of the day at 564 metres. 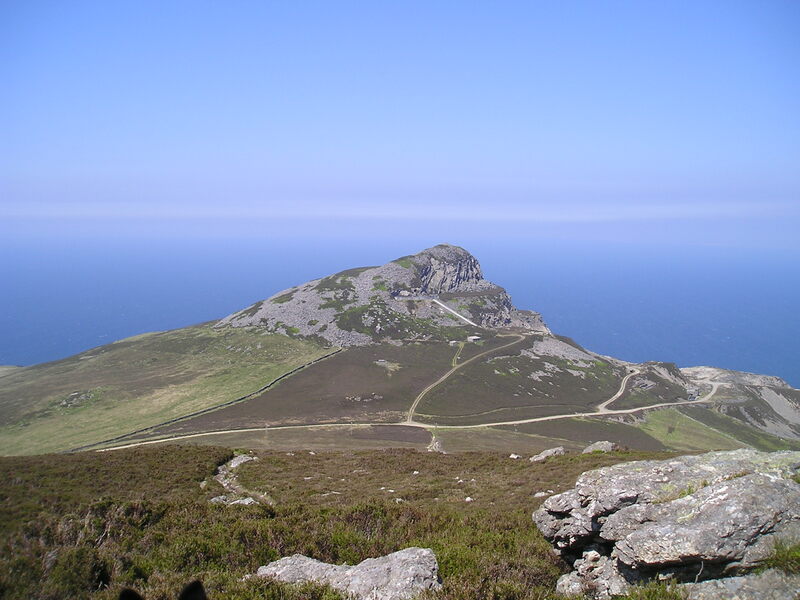 The views from the top are extensive, and include the Isle of Man, the Wicklow Mountains in Ireland, the Lake District and much of Snowdonia and Cardigan Bay. Not for us, though – last week the hill mist had restricted the views, today heat haze was the problem. 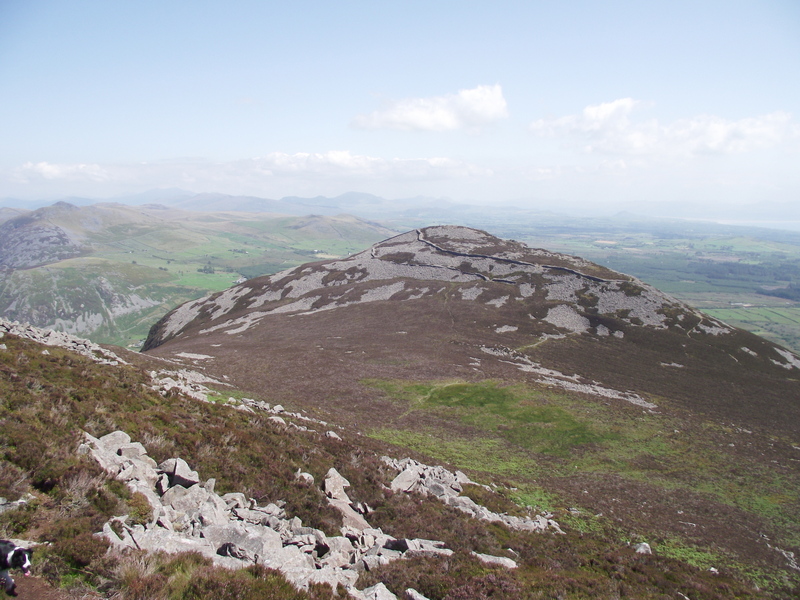 From there we descended yet again before the last summit of Tre’r Ceiri. 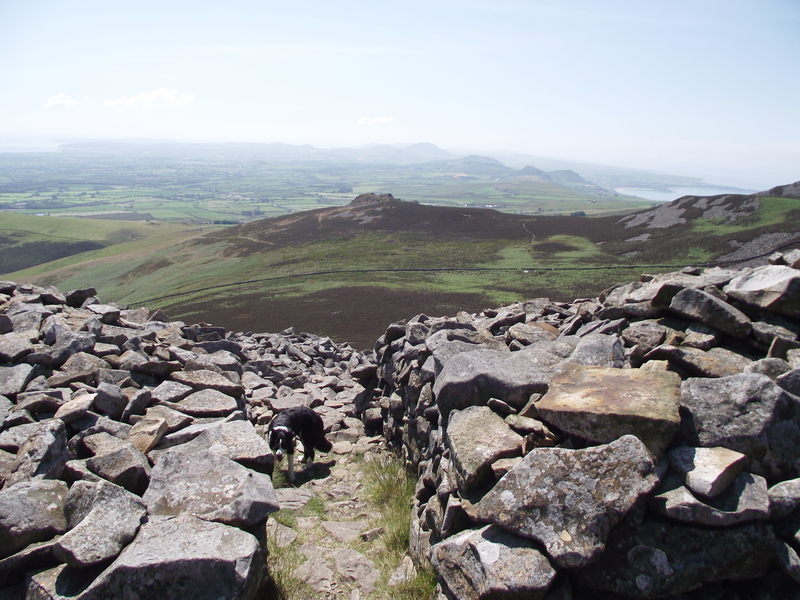 The outer walls of the hill fort, and the hut circles within the walls, can easily be picked out from Garn Ganol. 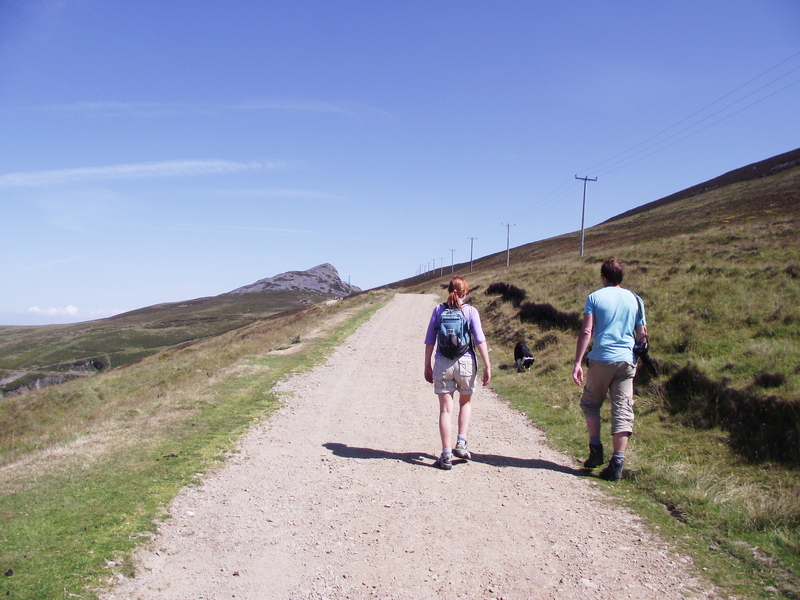 It’s best to allow ample time for a wander round, something that we had utterly failed to do – a combination of chatty fellow walkers and bilberry picking had eaten into our available time, and Penny and Vince had to get back to the Natural Retreats cottages at nearby Pistyll. So, we breezed into the fort by the gateway at the northwest side and breezed out again by the other gateway to the southwest of the fort. We yomped the remainder of the walk back to the car. Penny and Vince dashed off to the next phase of their mission, and I enjoyed a sunny drive back along the North Wales coast. ‘Mist’ continued, as she had all day, being a Border Collie…. she went to sleep! p.s. – really busy week. The Yr Eifl day was great, with Penny and Vince being witty and amusing company. Next day was a walk in the Peak District, followed two days later by an afternoon sailing on Windermere. The sad note of the week was the funeral of Mike Steel on Tuesday, a dear mate who will be sadly missed – good wake though, only marred by Mike not being there. This entry was posted in 5. 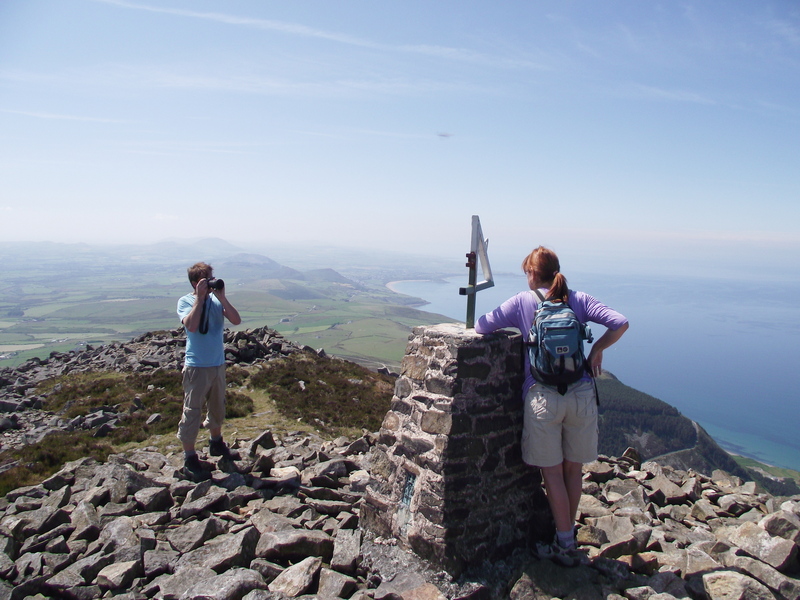 North Wales and tagged hillwalking, mountains, Snowdonia, Yr Eifl. Bookmark the permalink. Hi Paul, enjoyed your pictures and storys, the area looks quite breathtaking, I am thinking about doing a story on a leyline that runs close to the Hill Yr Efil was wondering if it may be possible to use a couple of your pictures, kind regards Keith Campbell. I’d be delighted for you to use some of the photos. If you just want to save them from the blog that’s fine, but if you wish I can send the original unedited images in a higher resolution – I could also include others that didn’t make it into the blog post. Otherwise, as I said I’m quite happy for you to take the images straight from the blog post, if the quality is OK for you. I’d appreciate a link to the leyline story when you post it – sounds really interesting! I’d also appreciate a link in your post to my blog if that could be done without spoiling the flow of your story – I’d be happy to reciprocate with a link back to your blog.